What caused the tree Mortality crisis? There are several reasons that the tree mortality crisis became such an issue in California. First, too many trees in a given area, “overstocking”, causes trees to compete for a finite set of resources (water, sunlight, nutrients), and they therefore become stressed and susceptible to attack. When California experienced extreme drought over the last several years this overstocking and lack of water led to an infestation of bark beetles. Bark beetles were always present however the trees' capacity to fight off the beetles was severely impacted due to the drought that California experienced over the past several years. Is there any way to treat or prevent bark beetle? Thinning and selective deep watering are the most common effective mitigations for this massive beetle infestation. 1. Thin the forest. Beetles are less likely to move to mixed and sparsely vegetated lands. Fall is the best time to thin the forest. It is important to clean up debris from trees because that could provide habitat for another type of beetle. There are 7 kinds of beetles that are affecting our forests in California. You can read about them in the handouts provided. 2.Water any “special trees” around their drip line (the outer edge of the tree based on its crown size) slow and deep. The trees are in stress due to lack of water. Deep watering may help special trees get to winter in healthier condition. To learn more about different ways people are treating bark beetle successfully, view the Recommended Readings and links in the Resources section here. Which trees should I cUT down? Get dead and unstable trees horizontal as soon as possible. It is recommended that landowners consult with a licensed professional forester or arborist if they are unfamiliar with tree harvesting practices. Dead trees nears homes should be felled as soon as possible, before winter hits with high winds that may bring trees down. Be aware of power lines, trees next to power lines should only be removed by people who receive special training to work within 10 ft of lines according to the California Occupational Safety and Health Administration (Cal/OSHA). You may also report dead, dying or diseased trees near power lines to PG&E by calling 1-800-743-5000. How can I get help Removing trees? If your tree is near a power line you can contact PG&E at 1-800-743-5000. If your tree is near a water system you can call Amador Water Agency at 209-223-3018. Is there financial support to help in my tree removal efforts? The US Department of Agriculture Natural Resource Conservation Service has released federal funding to assist in the removal of trees on private forest lands. For more information please call 209-223-6535. The press release can be viewed here. The County will send out Right of Entry permits to homeowners who may have dead trees on their property that could potentially impact County maintained roads or County maintained structures. Once the homeowner signs and returns the right of entry permit, they will be entered into a secure database which notifies the contractor which properties they can access. Do I need a permit to CUT down the trees? In some cases, yes (for example depending on tree diameter, acreage limitations, etc). If there is to be commercialization, the cutting or removal of trees that are processed into logs, lumber, or other wood products (firewood, burls, fence rails etc.) and offered for sale, barter, exchange or trade, then a permit is required. Please see this guide for reference. It is recommended to contact a local forester or arborist. How can I help/volunteer/get involved? If you are interested in donating funds for tree removal, contact Amador Community Foundation. Where can I take my wood after I FALL dead trees? The Amador County Tree Mortality Task Force has a committee dedicated to identifying potential sites to be utilized for as a storage location and sort yard for the wood from dead tree removal. If you are aware of a potential location, please email amadortreemortality@gmail.com. Please check the Resources Page under Material Solutions. IS there a list of registered professional foresters in amador county? List of local tree service companies and registered foresters. Blue Lake Springs Homeowners Association Lot Cleaning Services Information. Find the most updated list of CA Registered Foresters using this link. Find an updated list of ﻿Arborists using this link﻿. How can we ensure that the wood gets used and doesn’t go to waste? Please visit the Material Solutions section on the Resources Page here. i have a lot of dead trees on my property. who can i contact? Contact a local tree service company or registered forester here. CAN INSECTICIDES AND PHEROMONES BE USED TO PREVENT BARK BEETLE INFESTATIONS? Control methods are based on the life cycle of the bark beetle. Adult beetles live and reproduce under the bark of ponderosa pine and feed on the tree tissues. During the warm weather, the eggs develop into larvae, pupae and young adults that drill small exit holes in the bark and fly to other living trees to start a new beetle generation. When a female lands and bores into a susceptible tree, she releases a scent, called aggregation pheromone. This pheremone attracts large numbers of males and females to the tree causing a mass attack. As the space for beetles fills up, the beetles release a second scent, called anti-aggregation pheromone, that signals to new comers that there is ‘No Vacancy’. Mass attack kills the tree. By the time that you notice that a tree is dying or dead, the beetles have completed their development and left to infest other trees. There is no treatment for green trees with active infestations. However, pheromones and insecticides have been used to prevent bark beetle infestations. These treatments are expensive and limited to trees with high value. Anti-aggregation Pheromone called Verbenone when applied to the surface of the bark will reduce tree mortality depending on the species of beetle. Current commercial formulations of Verbenone DO NOT REPEL the Western Pine Beetle, the predominant species in the Mother Lode. Residual Insecticides, especially Carbaryl, sprayed on the surface of the bole from ground to 40 feet high kill landing bark beetles on contact. Careful field studies by entomologists show that a single application can protect 100% of ponderosa pine for one field season. In contrast, applications by pest control services have mixed results. In Calaveras County, some homeowners have protected all their trees, while others lost all their trees. The proper application of insecticides is complicated and spray failures follow inadequate coverage, improper mixing (e.g., using an alkaline water source with pH >8), inaccurate concentrations, improper storage, and/or improper timing (e.g., applying treatments to trees already successfully attacked by bark beetles). Before spraying your trees, become familiar with the application guidelines of the different insecticides starting with the ‘Recommended Readings’ for landowners and professional foresters. And, be sure to discuss your spray program in detail with your pest control service. Systemic Insecticides are inject­ed through the bark at ground level and slowly circulate throughout the tree. In one controlled study, emamectin benzoate protected ponderosa pine against the western pine beetle for three field seasons. While promising, additional tests are needed before systemic insecticides can be recommended as a preventive treatment. Tree mortality damage in Arnold, CA. 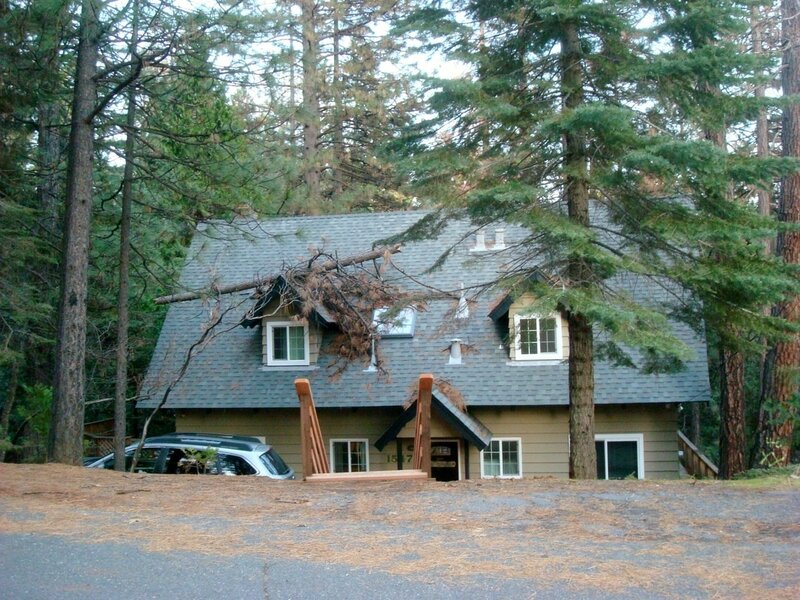 In December 2016, a beetle tree snapped in two during a storm and fell on the house of a homeowner in Blue Lake Springs in Calaveras County. Additional dead trees can be seen in the background that could also fall on the house if they are not removed. Other dead trees on this property threaten the neighbor's houses. DO NOT IGNORE WARNINGS TO FALL DEAD TREES IN YOUR AREA, ACT NOW.